Silly? 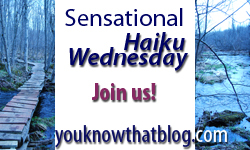 Haiku Wednesday « You know… that Blog? Folks, we had our best turn out last week, and broke a record for haiku submissions! You all rock my world!! The explanation for today’s haiku is simple. When I started Silly Haiku Wednesdays 31 weeks ago, I was flying by the seat of my pants. I do that – it’s how I roll. Consequently, regretfully, I didn’t put the amount of thought into the name as I probably should have. We’re not all that “Silly” most days. The amount of time and effort put in by all of you certainly suggests otherwise! We have come to take our weekly offerings very seriously, which I find immensely gratifying. I’ve also heard from a lot of people over these months who object to having silly in the title, and it has definitely held a few people back from participating. Haiku isn’t silly. Senryu certainly can be, but really? It was a poor choice of wording on my part. So let’s just fix this here and now! It’s time. Give me your ideas for what we can change the name of our Haiku meme to. Yes, it’s my meme, but those of you who participate faithfully week after week have a say too, as far as I’m concerned. Should we simply drop the “Silly” and make it “Haiku Wednesday”? Should we add a word to keep it going as SHW? Perhaps “Senryu/Haiku Wednesday”? How about “Sensational Haiku Wednesday”? Lets talk about it. What do you think? Leave me a comment; tell me how you feel. “Don’t do that!” they yelled. May be so or May be no. I’d still like to try. Tadpoles turn to frogs and toads. Nice one Knarf, I think the last one if my favourite, keep up the great Haiku’s. .-= Jade @ No Longer 25´s last blog ..A Braw Supper =-. I should explain that *I* am the one who has issues with men jingling change in their pocket. Frank and John both do it and it drives me around the BEND! That was wonderful!! Oh my goodness ! .-= Jillien´s last blog ..Haiku! You know it! =-. I love this meme, and thank you for your hard work. .-= stephanie (bad mom)´s last blog ..hormoaning =-. Hehe, Haiku-licious Wednesday – love it! Great Haiku, I was wondering what it was all about then I read the rest of your post. I think the title is fine personally, it shows that we don’t take ourselves too seriously and we can do something silly if we like. But it’s your meme and if you want to change it here are some thoughts: Haiku Wednesday on it’s own isn’t very inspirational, I think you need something else like Sensational Haiku Wednesday or Super Haiku Wednesday. You need to convey the message that it’s a fun meme – which it is. Or Jenn’s Haiku Wedesday Haiku Wednesday @ Jenn’s. I’m sure everyone will have lots of different opinions, I don’t really mind as long as you don’t stop! PS You comment luv thing is not picking up todays post, I’v been messing with my feeds, hope I’ve not broken something! .-= Magical Mystical Teacher´s last blog ..Watery Wednesday: Wishing Pool =-. Whatever you end up calling it I’m here for the long haul! .-= Polly´s last blog ..Tuesday Tidbits-Janary 26, 2010 =-. I’m with Polly, no matter what you call it I’m here to stay! I look forward to my weekly haiku fix! Super or Sensational Haiku Wednesday sounds good to me. .-= Chanda @ Eco-Cheap Mom´s last blog ..Bible in 90 Days – Update =-. .-= Melli´s last blog ..Dancing with My Stars =-. I’m leaning towards “Sensational” Haiku Wednesday, but lets see what everyone else comes up with today. OoooOo noow i get the poem…. I was wondering. There is power in a name. One can strive to fulfill the promise his or her or its name possesses. I’m not creative enough to start a meme and therefore, not creative enough to name one. .-= jazzbumpa´s last blog ..Silly Haiku Wednesday – Change =-. .-= JennyMac´s last blog ..Why my friends from NYC won’t come to Georgia… =-. I’ve been having fun – so I’ll play no matter the name! .-= RiA´s last blog ..Haiku =-. Gettin’ this week’s Haiku in under the wire. Had something else in mind (or was that “in my pocket”? ), but Knarf got there first so I have changed my thinking! Life on a planned path. Very appropriate, John :) I’m glad our changes included you, and that you’re as happy with them as we are! Currently the changes in my life have left me little time to do anything but run from pillar to post — and this head cold I’m suffering doesn’t help! Still, it is still Wednesday here, so I’ve just squeaked in under the wire. .-= quilly´s last blog ..Silly Haiku Wednesday: Changes =-. Yay 20 Haikus!! Well 20 participant, there’s even more than 20 haikus of course. Well done Jenn! .-= Jade @ No Longer 25´s last blog ..Change Haiku =-.